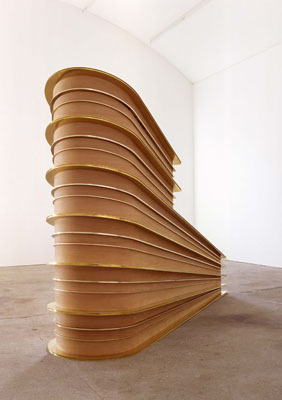 Replace the Irreplaceable, 2006, pear wood and brass, 7' 6 9/16“ x 10' 9 15/16” x 2' 11 7/16". While the systematic appropriation of modernist forms by contemporary artists is by now a familiar exercise, exhibitions like this one prove that by mining our aesthetic past, artists can still reveal new fields of meaning and beauty. Such exploration has even more momentum in a city like Vienna, rich as it is with memories of its avant-garde past. In the foundation’s elongated space, Belgrade-born artist Bojan Šarcevic has installed 1954, 2004, a series of black-and-white collages depicting modernist interiors taken from Baumeister, an architectural magazine of the ’50s. Šarcevic has cut out some of the architectural elements of the original images, reassembling them into new shapes—often geometric, at times organic. The resultant compositions play with the severe architectures by adding an almost psychedelic dimension. The show’s main sculpture, Replace the Irreplaceable, 2006, seems inspired by the collages on view. Evoking, on the one hand, a prehistoric exoskeleton and, on the other, the curvaceous spirals of an Art Nouveau staircase, the object is made from a curved piece of pear wood, beautifully decorated with brass lines that taper along the surface, as if to echo the foliated layers of a giant shell. A similar sense of zoomorphic elegance is evident in a series of six sculptures hanging from the rear wall. Šarcevic combines curved and straight brass segments, each of which is precariously suspended from colorful threads: With their arabesque design, these fragile notations acquire a strange musicality. By weaving together modernism’s tactile tangents, Šarcevic forges an alchemical realm, one which combines sensorial grace with a formal sensibility.